Good morning !!! Remember I told you I had taken a class this weekend at Craft Crossing ~well this is what I made!!! 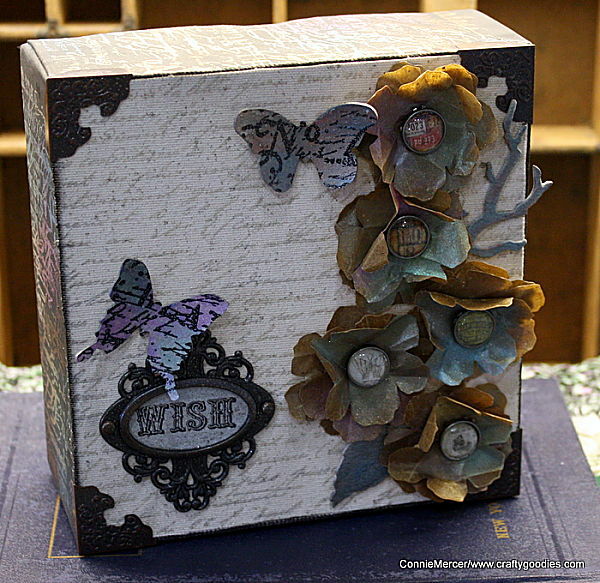 This class was taught by our local Tim Holtz guru~Penci Petty!!! I learned so many thhings!! I love working with canvas but so many times I don't know where to start!! 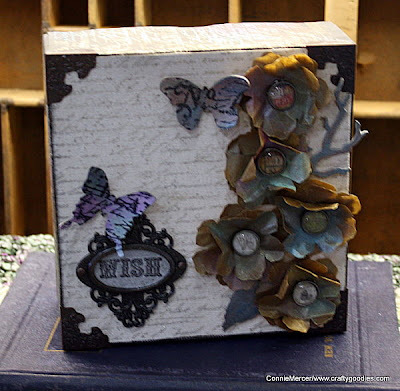 Most of the products are by Tim Holtz, if not all. Not sure about some of the stamps we used. My favorite was learning how to use Perfect Pearls with the Glassine paper. 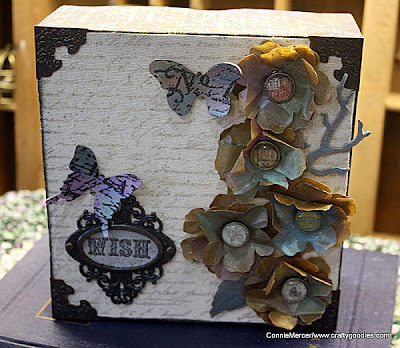 Take a close look at the flowers~Glassine paper with Perfect Pearls. The butterflies also have the Perfect Pearls barnished in them for added color!! Thanks Penci for a great class!! Last week when we had a week of flowers this one did not get shown. This style came from the Maya Road blog. There is a great video on making these flowers. 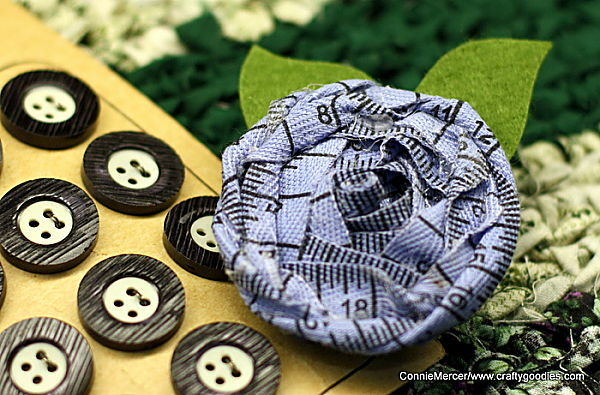 I loved the idea of using the measure ribbon for the flower. Go take a look~ Thanks for stopping in today and I will see ya soon!!! That is a beautiful canvas! Looks like a great class. love the flowers!! Loveeeeee your canvas! Loveeeeee all those flowers! Gorgeous!!!! Now this is the type of class I'd love to take! Beautiful! oh this is soooo pretty! what an incredible class! how lucky to have a tim holtz guru at your store! What a beautiful project Connie!! That flower is gorgeous!! Sounds like a FUN class and look at this canvas project = amazing!!! Love that you learned some new techniques - that's what a class is for, right?! Great job! loving those glassine flowers especially! I would have wanted to take that class! WOW, loving that project especially the flowers. Love the canvas..would love a class like that! So pretty! I'll bet you had such a fun time in this class. I love rosette made with a measuring tape, very clever. the dimensions are fabulous! lucky you..sounds like a great class. New follower! Thanks for visiting my blog. Love your work!! I really like your canvas and I'm heading over to Maya Road for the tutorial on the flower. Great job. You always send out inspiration with your creations.